There was mud. Lots and lots of mud. And there were sticks. Lots and lots of sticks. And for the second straight year, one of those sticks flipped up and found its way into my rear derailleur. 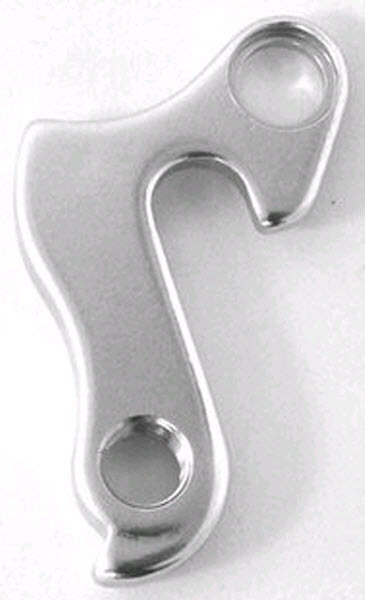 Once again, the hanger did its job and failed spectacularly, screwing my race. I was in wave 2, which despite it's name is the 3rd wave to start (there is an elite/VIP wave before wave 1). This time we lined up very early. I was actually surprised how few people were in the corral when we got there - we found ourselves way up in the 2nd row. This paid off in spades... right from the start I was in the top dozen or so of the wave with some very strong riders. As we trundled along the rail trail I found some excellent wheels to jump on. I was putting in a fair bit of effort just to stick with them, but we were flying and I was as high up as 2nd place in our wave at one point! I didn't let that wheel go lightly!! As we left the rail trail the strongest in our group pulled away. This was OK, I wanted to settle in a bit and recover. Not easy while tackling the rolling hills of that farm lane though, but I managed. This section is a bunch of rollers. I didn't have anyone to draft off for most of it, so just got into the drops and tried not to put in too much effort. Finally a group caught me so I tagged on to the back. This part was muddy again this year... I rode most of it, dodging between guys who weren't as... capable? Felt strong as I left that section through the farmer's field (which was wet and soggy). For some reason I remember this as being muddier and more like trails, instead it was fast gravel. Just settled in and pumped out a decent pace. Got on the wheel of some beast of a mountain bike guy... he was just killing it, he was big, and created a huuuge nice pocket. It was great. I took my turn for a bit, life was good! This one has this dark black mud, kind of like sand, and lots of twigs. And this is where my race ended. 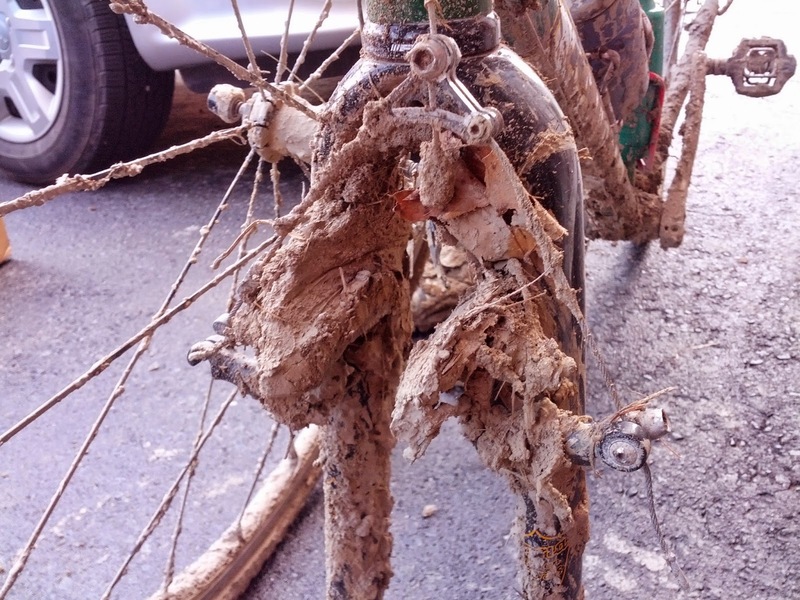 All I heard was the familiar "plunk plunk BLAM" of a chain lunching itself, looked down hoping to find a branch I could dislodge and continue, instead saw my rear derailleur hanging in a twisted mess of chain and twig. Again. Two years in a row. In frustration I threw my bike into the trees. Then I retrieved it, and got to work. I had a spare hanger, yay! Changing a hanger takes time. I made it that much worse when I screwed up the chain routing, and couldn't get my quick link to unlink! Long story short I did a quick fix, and five minutes later my chain went ka-pow and I was dead in the water again. I struggled with it for a bit, desperately needing a quick link to get back going... finally a kindly gentleman riding by stopped and gave me one! I was over the moon, I was going to finish the race today. Total time between the two stops: over 37 minutes. It felt even longer, it was awful. I'm not great at fixing bikes, but with the race pressure and everything it just made me that much suckier at it. Once I got going I was waaaaay back in the wave 3 folks. Now I just want to say something before I go on. Anyone out there given' 'er at Paris to Ancaster is awesome, front or back of pack. Just lining up at the start line means you're willing to take something on that the vast majority of people wouldn't dream of. So absolutely no disrespect. But because I was now back there, I had nobody going my pace to draft with/off, and when we got to tight sections sometimes it was tricky to get through. Went through the loose gravel farm lane, then through the town (village? hamlet?) of Harrisburg. Every year a kid puts a ramp in the road and I'm always too concerned about my race to hit it.. this year I was so far back I said "f it" and boom, nailed it (to the applause of the family). Awesome. Those little things make the race special! Rail trail, some roads, it all kind of blurs together... I was just moving on up as best I could. There's a section off Powerline Road that's a muddy little road, that's where I DNF'd last year... still muddy, still good, got past it (yay!). More roads. I don't know what they call it, but there's a spot where we used to turn left on the rail trail and head toward the finish... instead we turned right and headed away from it. First edge of the rectangle - fast rail trail. Good. Second edge - fast gravel road. Still good. Third edge - fast gravel road... ooooh wait, suddenly we're punted into a muddy grassy soul-sucking pace-sucking field!!! Good lord. This continued through the fourth edge, it was really tough slogging. The landowner lady was out there welcoming everyone, to which most riders were shouting "thank-you!"... it was pretty and a tough challenge, but tough is the key word. If your legs showed any weakness, this was a pretty tough nail in the coffin. Back to fast rail trail ... excepppppt there was a headwind. I was still picking people off one by one, though, but nobody to draft off of - it was tough. Then I had a new calamity. I came on a particularly large group of riders (probably a dozen) who were 3-wide across the whole trail. I called out the customary "on your left! ", at which point the lady on the far left pulled over. Just as I pulled out to pass her a rider came flying by GOING THE OTHER WAY! Not someone part of the race, just a guy who decided this was a great day to go the opposing direction of a race. I guess it's his right, but damn, I didn't see that coming at all. The 3-wide was a bit annoying too, just a bunch of people not really thinking. Me included I guess, should have been a bit more careful. Long story short - I ended up off the trails in the dry bush. A few scrapes, got back up, and kept going. Eventually caught up to the people, I didn't say anything but I was still steaming. After a few road bits we finally hit the mud chutes. I did my best to ride them, but there was so much traffic and people getting off to walk, it was impossible. 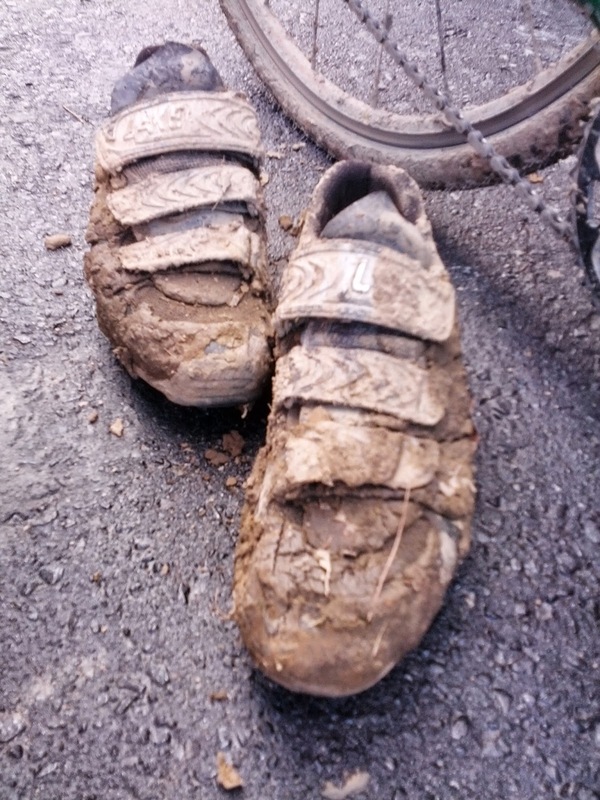 They were soupy and muddy, pretty much as bad as ever. Good lord this climb is a beast. I rode the entire thing, though, didn't walk a step, I think that's a first. No cramping! I know it's not apples to apples, but if you subtract the 37:26 I spent fixing my bike it'd be a 2:42:23 finish. It's hard to know for sure - I got a 40 minute break nobody else did, but I also lost all opportunity to draft and was held up a fair bit by slower riders. Not an exactly science, but I'm pretty sure a top-400 ride was there for me today with my fitness level. I felt awesome all day. Best of all, I had a blast. From hitting the ramp, to the generosity of the guy who gave me the quick link, to the people cheering the final climb - it was just as excellent an experience as always. Think I remember you. I overheard someone talking about dropping a chain. But then again, you likely weren't the only one. Ha no, definitely not the only one! In fact there was another guy who broke down exactly where I did who was already fixing his bike when I stopped. It's a destructive race.